This guest-post for the Alliance of Independent Authors (ALLI) details my genre switch from science writing to historical fiction Apparently the link I sent didn’t work for some folks, so here’s the post as it appeared on the ALLI blog site. By the way, if you are interested in Indie-Publishing, ALLI has done a lot of the leg work necessary for you to get up to speed. It costs a few bucks to join, but for this cheapskate, the benefits far outweigh the cost. and why he’s glad he did it. Even though conventional wisdom holds that changing genres from science writing to historical fiction would be a mistake, I found the allure of writing a novel set in the early thirteenth-century too tempting to resist. I have worked as a freelance science writer for the past 25 years, at the same time studying medieval history for personal enjoyment. Springboarding my portfolio of feature stories and public relations campaigns about advanced technology into a series of novels about a clan of thirteenth-century heretics promised to throw me into a rumination-induced coma. Happily, I love to dig, whether trying to unveil yesterday’s secrets or foretell of tomorrow’s miracles. I also love to fill in the blanks between the well-documented histories of emperors, popes and kings, and the untold stories of common folk who carried their everyday life experiences to their graves. So researching the Cathar heresy, and creating a world in which the humblest peasants came face to face with the most powerful clergy in the world, was a delight for me. Whether foolish or wise, I would write Heretic’s Prayer. Smoothing out the genre-switch wrinkle would wait for later. As I wrote and revised and work-shopped and trimmed and tightened and rewrote, I asked my writing group compatriots, “How am I going to switch genres?” Typically they would respond that between my science writing skill and the general appeal of the topic, I couldn’t help but succeed. Maybe so, I thought, but the “brand” I had so carefully cultivated through the years centered on advanced technology, not medieval history. Realistically, where did this science writer get off telling a story, set eight-hundred years ago, in a backwater village in the French Pyrenees? What did a family of female herbalists, expert in contraceptive and abortion-inducing herbs, have to do with science? And how did my characters come to defy the Catholic Church by professing to believe in two gods; one good, one evil? 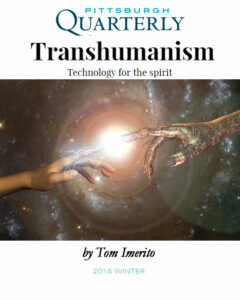 Then, by a stroke of good fortune, Pittsburgh Quarterly Magazine responded favorably to a pitch for a feature story about a newly emerging field of endeavor called Transhumanism which entails the incorporation of technology into the human body. My research for the story led me through scores of science topics I had covered through the years, as well as a few jaunts into the humanities which I had never counted as wayposts on my sci-tech beat. The citation spun my compass, stumped my thinking and slung me off to the sands of the Near East where the Desert Fathers and Mothers lived in the early days of Christianity. Athansius’ centuries-old words reconciled the modern-day debate between science and religion at the same time it resolved my genre-switch problem. Much like today’s Transhumanists, who use their knowledge to improve the human condition by means of advanced technology, the female herbalists who populate Heretic’s Prayer were trying to make life better with their knowledge of the natural world. 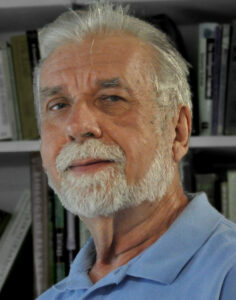 As a science writer, I had promoted myself as Tom Imerito – Publicity for Technology. 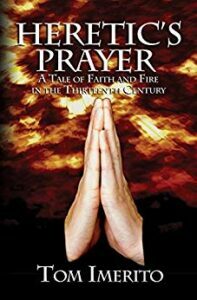 As the author of Heretic’s Prayer and its sequels I became Tom Imerito – Historical Fiction Where Science Meets Spirit. My new brand allowed me to merge my two genres without abandoning either. I wish I could say I employed a formal method to achieve my genre transition, but I cannot. The fact is, my writing did it for me. If you happen upon a similar problem, I hope you are as lucky as I was in having your work point the way for you. For alerts about Tom’s Blog, New Releases and more Free Reads, please subscribe.